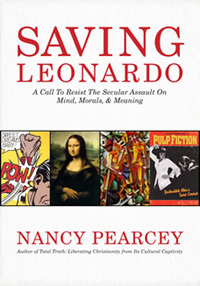 Nancy Pearcey has done it again. Her book Total Truth captured the attention of thousands and helped equip a new generation of thinking Christians. While some consider the term “thinking Christian” somewhat of an oxymoron (think, “military intelligence,” or “jumbo shrimp”), nothing could be further from the truth. Indeed, clear thinking and warm-hearted devotion are crucial characteristics for anyone who professes faith in Christ. Anyone who rejects the notion of a “thinking Christian” should pause and consider the thought process generated in order to make the claim! “Science deals mainly with facts; religion deals mainly with values.” – Martin Luther King Jr.
Part two uncovers two paths to secularism, namely, the Enlightenment and Romantic movements respectively. The Enlightenment (or Analytic Tradition) is fixated on reason and relies on the scientific method. Immanuel Kant plays a central role here with his nature/freedom dichotomy. Various worldviews have been spawned as a result of Enlightenment thought including empiricism, rationalism, Darwinism, logical positivism, linguistic analysis, utilitarianism, and materialism. The Romantic stream (or Continental Tradition) relies on story and is fascinated by myth and imagination. Again, various worldviews have resulted including idealism, Marxism, deconstruction, phenomenology, existentialism, pantheism, and postmodernism. Both streams are reductionistic and the author is careful to bring this point home repeatedly.